"My house had lingered on the market for over a year when I listed with Terry and Cindy. Cindy staged the house - free as part of the signing package. Then Terry sold the house within weeks for an above-average price! My only regret is that I don't have another house for Terry to sell. Terry is a charismatic and savvy salesman who aggressively follows up every lead and actively sells his properties to prospective buyers and their realtors. As a professional, I appreciated Terry's prompt and helpful responses to my concerns and requests for information. I would recommend Terry to anyone who wants to buy or sell a house. Terry is efficient and expertly handles all details of the sale, from listing ...to selling ...to close of escrow." "We would like to pass along our sincere appreciation and thanks for the high level of professional service and courtesy provided by Terry and Cindy Prowant in our recent real estate transactions. The Prowant Team were able to pull us through our sale process in a very tough luxury market, and they are to be commended for their care and attention to detail throughout the process. We have known Terry and Cindy now for more than five years since our first purchase of a home in Arizona, and we certainly had no hesitation to engage them again on our recent transactions for both a sale and new purchase. Terry and Cindy bring a very honest, knowledgeable, and candid perspective to help clients make appropriate decisions. The Prowant Team certainly goes above and beyond the standard process to ensure customer satisfaction, and we would most definitely recommend them to anyone seeking a professional real estate service provider in Arizona." "Professional, friendly, and caring are all adjectives that describe Terry and Cindy Prowant, but most important for any seller is they know how to get a home sold. We recently had the pleasure of selling yet another property with Terry and Cindy as our agents. This was the 3rd property we listed with them, and the previous two sold within 6 and 2 days respectively. This property was the most challenging as it was our primary Scottsdale residence and needed major remodeling and updating. The Prowant Team helped us source contractors who were reliable and affordable. Cindy's design flair and vision turned a dated Southwest home into an inspired Tuscan home. The transformation was stunning and received universal praise from neighbors, realtors, and prospective buyers, and within just 18 days on market we were in contract! Terry skillfully navigated a difficult negotiation with a very savvy buyer, and we received market value and won favorable terms in every area of importance to us. He successfully guided everyone through the inspection and escrow process and the property actually closed early. I can't give a better testimonial than the results we achieved together, except to add how much fun we had doing it!" "Terry and Cindy came highly recommended to us for selling our home and they did not disappoint. We appreciated Terry's demeanor, both professional and thoughtful. Terry, in partnership with Cindy's excellent decorating skills, helped us sell the house in 4 hours. What was so impressive was the effort Terry put forth in preparing a book of information for the appraiser to help ensure he had the most current and pertinent comparables. We couldn't have had a more positive experience and will use them again!" "I can't say enough about The Prowant Team! The sale of my home was handled by Terry and Cindy in a very professional, expedited manner, despite the fact that it was a highly complicated short-sale. Terry worked tirelessly for countless hours on the phone to get the deal done, and he was always there with answers to my questions and concerns. They have earned a customer for life!" "I am consistently impressed with Cindy and Terry, even now, two months after the purchase of my new home has closed. Terry has continued to work with me to ensure that the punch list of items have been completed to my satisfaction, and when he finds that they aren't, he does what he always does:he inserts himself until the work is done to his level of quality...which is high, and which is why I appreciate him so much. He has gone above and beyond for me in so many instances in both the sale of my old home and the purchase of my new home. I will never use another Realtor...they could not possibly fill his shoes." "Terry and Cindy Prowant are professional, knowledgeable, and customer focused. They have helped us navigate 3 transactions - two purchases and one sale - all with success far beyond our expectations. The Prowant Team has earned our trust with their patience and customer service, and have become family friends. Give Terry and Cindy a call. I promise you will be glad you did!" "Terry and Cindy, thank you for making our house buying efforts such a good experience. You were always prepared and would immediately respond to our questions and concerns. Your professionalism, kindness and expertise are top-notch. We certainly appreciate all your efforts and highly recommend you to others." "Thank you for a job well done in selling our home. We believe that your continued marketing of our home to the other Realtors in the area, as well as Cindy's outstanding staging made our home stand out and closed the deal. I believe this speaks volumes for your professionalism and reputation with your peers. We also sincerely appreciate the guidance you provided to help us sell our home. Selling a home is stressful...selling a home from 2300 miles away is really stressful. We can't thank you enough for your hard work. You delivered what you promised...a great ending to a significant emotional event in our lives and a successful, uneventful closing. You had us prepared for success. Terry and Cindy, you two have our whole-hearted recommendation!" Rob and Dr. Linda F.
"Terry and Cindy Prowant helped our family with several real estate transactions. First was helping our daughter purchase a house in the Coronado Historic district in Phoenix. The Prowant Team offered her guidance on her first ever home purchase, including recommending a lending agency for pre-qualification, and a home inspector that did a very thorough job. Next Terry and Cindy helped us find our "empty nester" home in the Coronado Historic district in Phoenix. Once again their experience and support team were on the mark. The purchase process was smooth, professional, and without problems. Next Terry and Cindy helped us sell our home in NW Gilbert. In the process of selling this home, Cindy provided her expertise in staging the house to bring the value up fairly significantly. For around $15,000 in upgrades and refresh, the sell price settled in at $50,000+ more than the house would have comfortably sold for had we not followed the guidance. Their neighborhood assessments, professional advice, close attention to comparable sales, and support throughout the process was invaluable. We highly recommend the Prowant Team to every person we know that is considering buying or selling a home. Terry and Cindy - you two have great vision. You're our realtors for life." "I had the recent pleasure of meeting Terry and Cindy for the purpose of selling my Scottsdale condo. They proposed to properly evaluate, stage, and price the unit for a quick sale. They also took the time to show me similar units that had sold recently and that were currently on the market. Cindy then staged the condo for sale. What a surprise masterpiece. Terry had the unit professionally photographed, which put all the comps to shame. His writeup and description were equally magnificent. Needless to say they had an offer in 4 days and we closed in 30 days. I have named them "THE DYNAMIC DUO." They get the highest rating for professionalism and integrity." "As a first time homebuyer, I really had no idea what I needed to do to buy a home or what to expect. Terry and Cindy were with me every step of the way- working with me, listening to what I wanted, coaching me, narrowing down the search, viewing properties, making an offer, closing, and even following up after closing. In the end I got the house I wanted and within my budget. 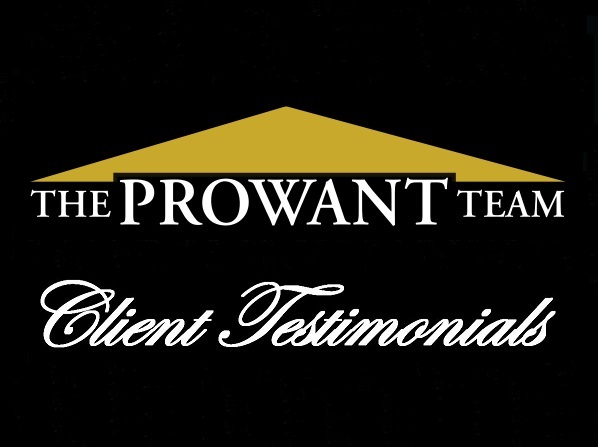 Thanks to the personalized service I received from The Prowant Team, my home buying experience was nearly effortless." "The Prowant Team did a FANTASTIC job assisting us in purchasing our vacation home. Terry and Cindy helped us learn about the areas, offered great suggestions, listened to our concerns and were able to help us narrow down our choices. And the service was first class through the purchase and has been so well after the purchase was completed. Thanks for all your help - we have already recommended you to others we know." "We had been trying to sell our home for six months. When Terry stepped in, he was really aggressive and a great communicator. Before we knew it the house was sold and we feel like we got a great deal. Thanks Terry!" "Julie and I would like to sincerely thank you for assisting us in our recent foreclosure purchase. We truly commend your hard work. Our new home is the third house that we have owned. This transaction was by far our smoothest, start to finish, even in this unpredictable and transitional market. We attribute your success as a Realtor to your perseverance, professionalism and familiarity with complex transactions. We commend your unwavering devotion to your clients. Working with a real estate consultant such as you makes us look forward to the next time we buy or sell real estate property. We have and always will recommend you to anyone who is looking to buy or sell real estate." "Terry, we truly appreciated all you did to get the house sold. You and Cindy set the bar for the Realtor profession." "Terry, thanks to you and Cindy for making my home buying process effortless. I have to say, Dave B. provided me with great advice in recommending you two in regards to looking for a home. Both of you have been fantastic and it is truly appreciated." "Dona and I appreciate all the work you did over the past year, keeping us informed of what houses were like here in Arizona and waiting patiently until we put our house up in Davenport, Iowa. You carried us smoothly from beginning to end of this process of buying our new home. Great job - Thanks!"